https://globaldevincubator.org/privacy-and-legal/ buy now On Wednesday evening, May 1, the 500-member La Mesa Foothills Democratic Club will be honored to host an address by SDSU President Dr. Adela de la Torre. Among the many topics we hope she’ll include are those that will most affect our close relationship with the large campus on the western edge of our club’s membership boundaries. viagra no prescription What is the timeline and detailed plans for Mission Valley West and the future of that monumental undertaking for the expansion of SDSU? How will this expansion affect the academic growth of SDSU in terms of added majors and areas of study, if at all? trusted tablets How is SDSU now responding to the “mini-dorm” crisis? Have recent city initiatives assuaged any of the complaints from near-school neighborhoods? What is the future of SDSU football and the use of the existing stadium? How long term are the plans for a replacement multi-use facility for Aztec sports and professional soccer? Can the existing stadium be used for Aztec Football until the new stadium is completed? What about the student debt crisis? (Total national student loan debt is now larger than the total credit card debt in the United States.) SDSU’s rising cost of tuition? Availability of scholarships, grants and work study to reduce student debt and school costs? Will students bear any of the cost of the SDSU West project? These are but a few of the topics of interest to those of us that are neighbors, alumni, students and supporters of San Diego State University. Of course, there are many other subjects that we’d love for Dr. de la Torre to address, particularly with her unique experience and personal background. We’d be remiss if we didn’t ask her to share her significant expertise on transnational health issues and how this is one of many concerns we have with building walls instead of bridges between the United States and our important cultural, geographic and economic neighbors to the south. 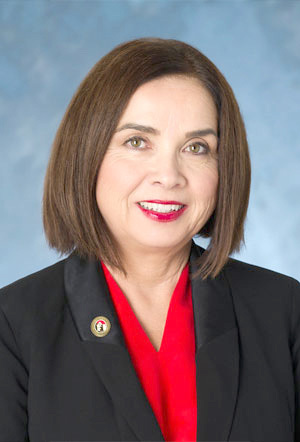 Dr. Adela de la Torre was appointed by the California State University Board of Trustees as the new president of San Diego State University. Joining the campus in June 2018, Dr. de la Torre is the ninth permanent president of SDSU and the first woman to serve in that role. She brings with her 30 years of service in leadership roles within institutions of higher education, including the California State University system, the University of Arizona and the University of California, Davis. Prior to her appointment as SDSU president, she served as the vice chancellor for Student Affairs and Campus Diversity at UC Davis. Dr. de la Torre’s research focuses on aspects of Latino community health — an area in which SDSU is a national leader. We’ll also have the privilege of hearing from the newly elected chairman of the San Diego County Democratic Party, Will Rodriguez-Kennedy. He will talk about the important issues facing local progressives, the upcoming 2020 election cycle, how we can get involved in electing Democrats in important local and regional races, and most of all, how we can keep the Blue Wave going from our great success in 2018 in San Diego County. 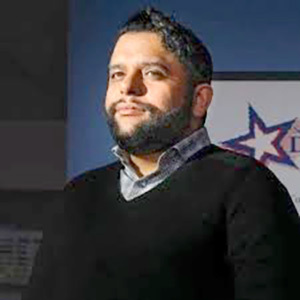 Will Rodriguez-Kennedy got involved in politics through the LGBTQ+ and veteran communities fighting the “Don’t Ask Don’t Tell” policy, which had affected him during his service in the United States Marine Corps. He first got involved in the San Diego County Democratic Party as an alternate in 2012. He went on to serve in various campaigns as an organizer and in campaign finance. He has served on the San Diego County Veterans Advisory Council and on the board of San Diego LGBT Pride. He was also elected president of the San Diego Democrats for Equality and the California Young Democrats. The May 1 meeting will begin at 6:30 p.m. at the La Mesa Community Center, 4975 Memorial Drive, just north of University Avenue in La Mesa. Please join us as a guest or become a member, with our modest annual dues starting at $30. Like us on Facebook and check out our new website lamesafoothillsdemcoratic club.com. — Tina Rynberg is president and Jeff Benesch is vice president of programming for the La Mesa Foothills Democratic Club.